South African Intervention a Silver Bullet for Zimbabwe's Crisis? 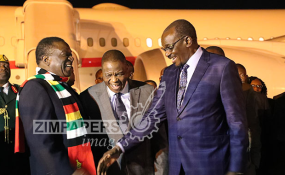 President Emmerson Mnangagwa with his deputies Constantino Chiwenga and Kembo Mohadi on his arrival at Robert Gabriel Mugabe International Airport. SOCIAL media sites have finally been restored in Zimbabwe following a week-long government blackout which drew out a high court challenge and a subsequent Monday ruling declaring the freeze illegal. Government switched off popular micro blogging sites - Facebook, WhatsApp and Twitter - following deadly national protests that coincided with a job stay away called by the Zimbabwe Congress of Trade Unions and associated social movements. The blackout was at the behest of the State Security Minister who issued a warrant for a total shutdown of internet services at the height of the violent national skirmishes. The protests followed a government decision to hike fuel prices by more than double. For the entire week, locals failed to communicate using their favourite micro-blogging platforms which government claimed helped stir up violence among angry locals. The Zimbabwe Lawyers for Human Rights took the state to court to challenge the unpopular decision which has inconvenienced many and cost businesses a lot of money. In its petition, ZLHR argued that the internet blackout put the lives of both businesses and individuals at risk since many locals relied on electronic forms of payment for things like medical charges. The court ruled that the government's shutdown of the internet was illegal because the Minister of State for Security, who ordered the internet closure, did not have powers to issue such a directive. Exiled former Higher and Tertiary Education Minister Jonathan Moyo described the government internet freeze as an attempt to stop locals from sharing information and images from a brutal crackdown by armed forces on those accused of taking part in the deadly protests.